March is National Social Work Month, and the best time to recognize and thank dedicated social workers throughout the country. Shop our selection of new and best-selling appreciation gifts featuring inspiring messages that include our exclusive theme, Social Workers: Believing Change Is Always Possible. You’ll also find additional unique motivational designs and slogans to further compliment your hard-working social workers and Social Services team members. Generate excitement for your celebrations by displaying our boldly designed, 2-sided Event Poster throughout your facility. It's a great way to get everyone involved in your upcoming festivities, plus it keeps the focus on the importance of your social work staff. We also offer distinctive gifts of appreciation for social work events, perfect for creating a cohesive and lively atmosphere that celebrates the helpful advocates on your team. When it comes to recognition gifts, you'll discover so many ways to say "Thank You" to deserving employees. From tote bags and drinkware to tech products, T-shirts, and even our money-saving combo packs, you'll find cost-effective and thoughtful selections that are sure to be popular. 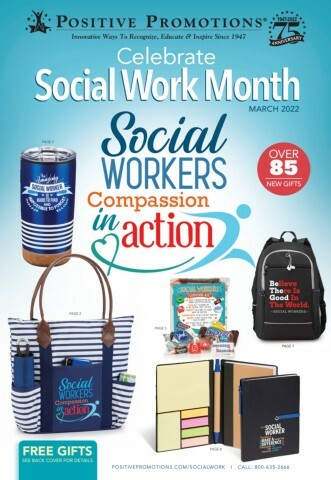 There are also unique social work appreciation gifts like messenger bags, tumblers, and lunch coolers that your team can use at work and at home. You can also thank staff members for the positive changes they inspire with stylish apparel gifts. A great way to boost morale, unity, and team spirit, our selection includes great-looking T-shirts sporting a variety of designs, embroidered sweatshirts and polo shirts, and more–each one offering a fantastic way that social workers can wear their professional pride for all to see.